Heraeus Sepatech Baxter Megafuge 1.0 Centrifuge 6000 rpm w/ BS4402/A Rotor . New Life Scientific, Inc. This Heraeus Sepatech Megafuge 1.0 centrifuge was recently calibrated in May of 2017, not due for recalibration until June of 2018. This centrifuge was fully tested and reaches the max speed of 6,000 rpm with the BS4402/A rotor (includes all four weights, but not buckets). It was noted to be shaky during operation when the weights are installed, however, the shaking is reduced when the weights are removed. 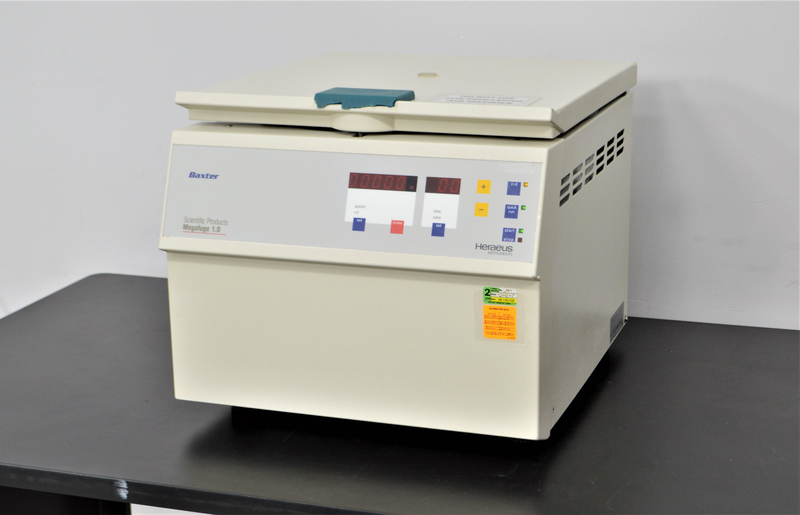 This Heraeus Sepatech Megafuge 1.0 centrifuge is in good cosmetic condition, with minor wear and a chipped plastic lid handle and power switch which in no way affects the performance of the instrument. Our in-house technician inspected and tested this Heraeus Sepatech Megafuge 1.0 centrifuge, confirming it to reach the max speed of 6,000 rpm with the BS4402/A rotor. This centrifuge was noted to be shaky during operation when the balancing weights are installed. No other problems were found during testing.